Once upon a time, way back in 2001, armed with a 3D modeling tool called Moray, and a rendering solution known as Povray - I created planets. Not just one or two, hundreds. All of different sizes, colours, shades and styles. Ok, the shapes were all identical, but the colours and textures were varied and detailed. Moray/Povray had a beautiful texturing system that allowed you to quickly build procedural textures using well placed numbers and handy algorithms disguised clever pattern designs. 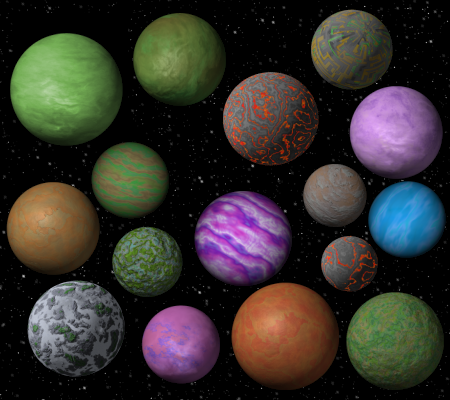 All these planets were put together for Space Empires IV, trying to ensure that the same planets wouldn't crop up twice within the same game. They each had their own descriptions, portraits and minis. It was quite an acheivement. However I managed to lose that collection, I really don't know. Such a shame. I managed to hold on to some stragglers which I've packaged into the picture above, but theres nothing left that I can find.